Prof. Sharwan Kumar of M M Modi College, Patiala was felicitated at the 10th International Conference on Business Management and Economics organised by Punjab Commerce and Management Association (PCMA). 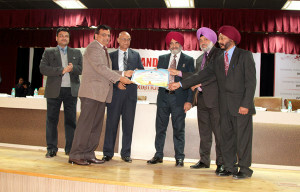 The conference was held at Chandigarh University, Ghrauan (Mohali). Prof. Sharwan Kumar was felicitated with the award for his meritorious services rendered in the field of teaching commerce and management. He has been in teaching profession for the last 31 years. He also visits Direct Tax Regional Training Institute (DTRTI), Chandigarh as the guest faculty. Prof. Sharwan Kumar was honoured by Prof. Prem Kumar, Chairman Emeritus PCM, Prof. G. S. Batra, Punjabi University, Patiala. Prof. R. S. Bawa, Vice Chancellor, Chandigarh University, Dr. Dharminder Singh Ubha, Director, Education, SGPC. Dr. Farkan Quamer, V. C., Central University, Himachal Pradesh, Lt. Gen. Dr. D. D. S. Sandhu, V. C. Kurukshetra University, Dr. Pawan Kumar Singla, Controller Examination, Punjabi University, Patiala and Principal, Khushvinder Kumar were also presented on the occasion. Dr. Khushvinder Kumar, Principal, M. M. Modi College, Patiala congratulated him and appreciated his services.